The cyclonic storm lashed out in several parts of lower Assam on Thursday night, caused extensive damages to the house, crops and other properties and the uprooting of trees have blocked the roads in various places. 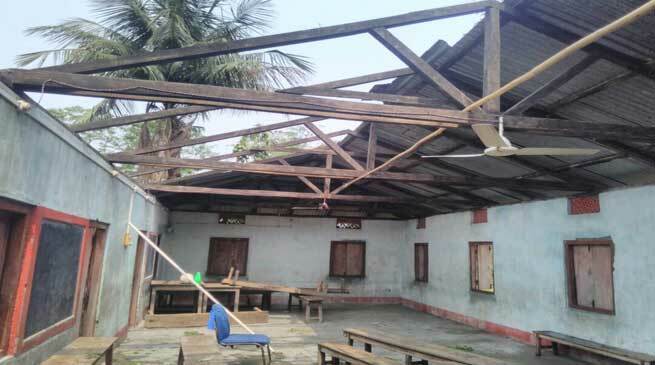 Several government establishments including, government health centers, BSNL tower and ASEB poles are brought down on the ground in Sarfanguri area of Kokrajhar district. Athiabari, Shialmari, Nepalpara, Pakriguri, Debargaon, Podmabil, Mwinaguri, Kachugaon,Singmari etc. have been affected under Dotma Circle. Amguri and Serfanguri areas are the worst hit place in the cyclonic storm. A local resident of West Tengaigaon said the cyclonic storm began at 8 pm that lasted for four hours came from South West Direction. He said the cyclonic storm caused extensive damage to the properties of villagers, the tin sheets of the houses were flown away, crops are damaged and some government establishments have also damaged. He also said similar cyclonic storm hit entire Gossainichina areas in 2000 where over 30 villages were badly damaged. Sources from OC, Serfanguri said the BSNL tower at Nepalpara in Serfanguri has crumbled down the ground and ASEB Sub Station located near Janata College in Serfanguri was also badly damaged. The storm also hit Kachugaon and Halangbazar of Patgaon areas. The Kokrajhar town was also hit by massive storm as several trees have been uprooted leading the damage of electricity poles. The town is under the darkness as power supply is stopped after extensive damage. People of Kokrajhar town are in misery due to lack of power supply. The massive storm also hit parts of the Northern part of Kokrajhar.